Ghanaatiyan, R., Amiri, A., Sogandi, F. (2017). Multi-Objective Economic-Statistical Design of VSSI-MEWMA-DWL Control Chart with Multiple Assignable Causes. 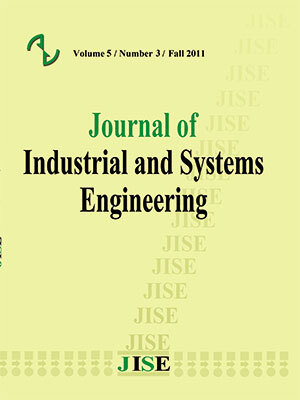 Journal of Industrial and Systems Engineering, 10(special issue on Quality Control and Reliability), 34-58. Raziyeh Ghanaatiyan; Amirhossein Amiri; Fatemeh Sogandi. "Multi-Objective Economic-Statistical Design of VSSI-MEWMA-DWL Control Chart with Multiple Assignable Causes". Journal of Industrial and Systems Engineering, 10, special issue on Quality Control and Reliability, 2017, 34-58. Ghanaatiyan, R., Amiri, A., Sogandi, F. (2017). 'Multi-Objective Economic-Statistical Design of VSSI-MEWMA-DWL Control Chart with Multiple Assignable Causes', Journal of Industrial and Systems Engineering, 10(special issue on Quality Control and Reliability), pp. 34-58. Ghanaatiyan, R., Amiri, A., Sogandi, F. Multi-Objective Economic-Statistical Design of VSSI-MEWMA-DWL Control Chart with Multiple Assignable Causes. Journal of Industrial and Systems Engineering, 2017; 10(special issue on Quality Control and Reliability): 34-58. This paper proposes a multi-objective model for the economic-statistical design of the variable sample size and sampling interval multivariate exponentially weighted moving average control chart by using double warning lines. The Markov chain approach is used to obtain the statistical properties. We extend the Lorenzen and Vance cost function considering multiple assignable causes and multivariate Taguchi loss approach to obtain the expected cost per time unit. The meta-heuristic non-dominated sorting genetic algorithm is used to search for the Pareto optimal solutions. A numerical example is provided to illustrate the solution procedure. Finally, sensitivity analyses for some parameters are given. Amiri, A., Mogouie, H., and Doroudyan, M. H. (2013). Multi-objective economic-statistical design of MEWMA control chart. International Journal of Productivity and Quality Management, 11(2), 131-149. Niaki, S. T. A., Ershadi, M. J., and Malaki, M. (2010). Economic and economic-statistical designs of MEWMA control charts—a hybrid Taguchi loss, Markov chain, and genetic algorithm approach. The International Journal of Advanced Manufacturing Technology, 48(1-4), 283-296. Prabhu, S. S., and Runger, G. C. (1997). Designing a multivariate EWMA control chart. Journal of Quality Technology, 29(1), 8-15. Reynolds Jr, M. R., and Cho, G. Y. (2011). Multivariate control charts for monitoring the mean vector and covariance matrix with variable sampling intervals. Sequential Analysis, 30(1), 1-40. Rigdon, S. E. (1995). An integral equation for the in-control average run length of a multivariate exponentially weighted moving average control chart. Journal of Statistical Computation and Simulation, 52(4), 351-365. Roberts, S. W. (1959). Control chart tests based on geometric moving averages. Technometrics, 1(3), 239-250. Runger, G. C., and Prabhu, S. S. (1996). A Markov chain model for the multivariate exponentially weighted moving averages control chart. Journal of the American Statistical Association, 91(436), 1701-1706. Safaei, A. S., Kazemzadeh, R. B., & Niaki, S. T. A. (2012). Multi-objective economic statistical design of X-bar control chart considering Taguchi loss function. The International Journal of Advanced Manufacturing Technology, 59(9-12), 1091-1101. Safaei, A. S., Kazemzadeh, R. B., & Niaki, S. T. A. (2012). Multi-objective design of an S control chart for monitoring process variability. International Journal of Multi-criteria Decision Making, 2(4), 408-424. Saniga, E. M. (1989). Economic statistical control-chart designs with an application to and R charts. Technometrics, 31(3), 313-320. Seif, A., Faraz, A., and Sadeghifar, M. (2014). Evaluation of the economic statistical design of the multivariate T2 control chart with multiple variable sampling intervals scheme: NSGA-II approach. Journal of Statistical Computation and Simulation, Published online. Woodall, W. H., and Ncube, M. M. (1985). Multivariate CUSUM quality-control procedures. Technometrics, 27(3), 285-292. Yang, W. A., Guo, Y., & Liao, W. (2012). Economic and statistical design of and S control charts using an improved multi-objective particle swarm optimisation algorithm. International Journal of Production Research, 50(1), 97-117.